We are proud to say that our work has been all across the country. Our clients are looking for work that is expertly crafted and beautifully designed, and our experience speaks well to our ability to achieve both. We are glad that the kind of work we do allows us to service people from all over, and create all kinds of masterpieces. Working with a lot of different homes gives us a lot of insight and perspective into what homeowners are looking for, what kinds of outdoor landscapes we are working with, and how truly unique each home is. For this project, we took a trip to the southern heartland of America—all the way to Sweet Home Alabama. 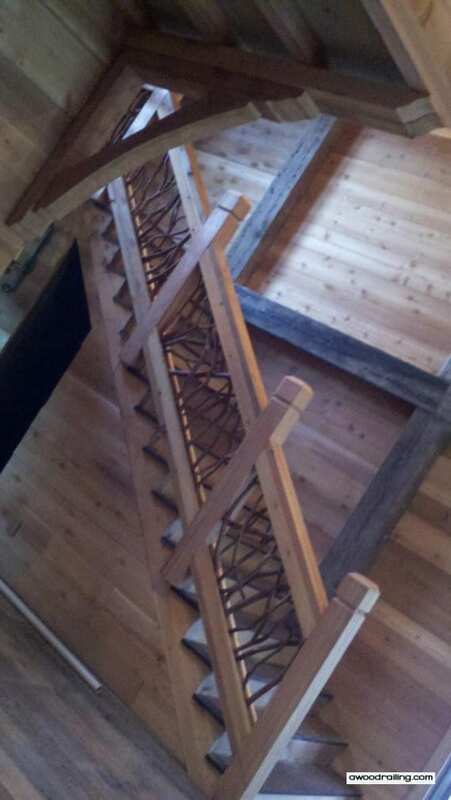 We were asked to install a grand interior stair railing. We took a look at the home and were, as we always are, thoroughly impressed by its beauty–this one especially took our breath away. 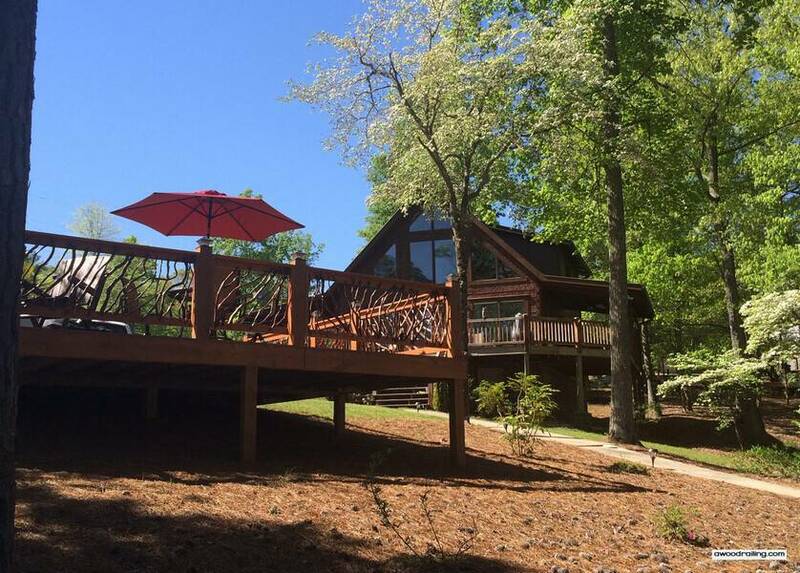 The home is located on a lake, and has all the southern charm you would expect of a lake house in Alabama. Being close to a body of water always gives homes a sense of grandeur, as the inside of the home is always built to match the magnificence of the outside. This homeowner had really put work into the interior, and it showed. The home was newly remodeled with a completely new interior with reclaimed beams and flooring and custom woodwork throughout. The flooring featured a multi color stains with the different panels looking like they were made from a different type of wood, an elegant and eclectic look we appreciated. We were excited to see what we could contribute to an already beautiful interior, working closely to match the themes, patterns and textures already present. There were a few things we knew we had to take into consideration here. 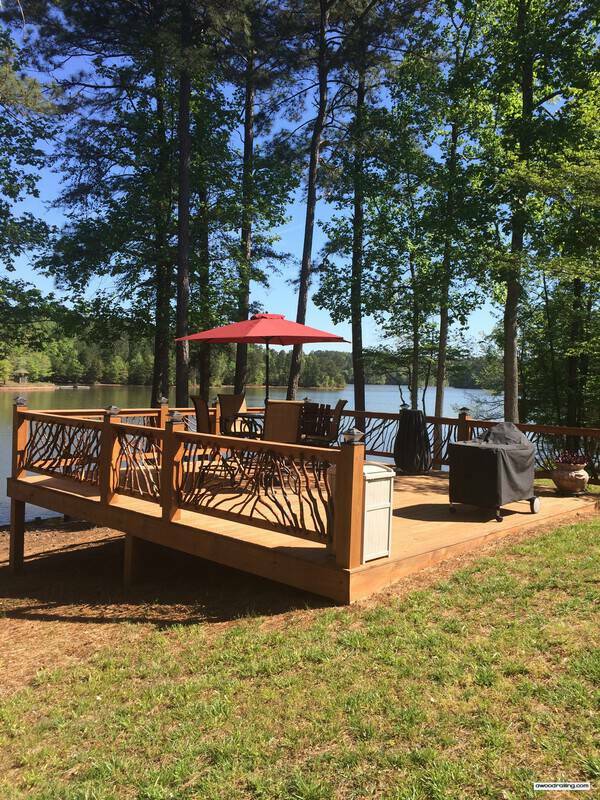 First, this is a gorgeous, large home that boasts equally beautiful outdoor scenery. We had to bring in something as grand as the home to properly match its decor and its atmosphere. This was the time to go bigger, instead of smaller, as a small, dainty interior stair railing would look silly against this backdrop. Second, there was a great deal of woodwork already—this was the theme that tied this home together, so we wanted to make sure the stair railing looked like it belonged. We took time to get a sense of the kind of woodwork present, as there were multiple kinds of color and stains. We appreciated that, since a singular color throughout the home would look a little too uniform. Finally, we had to keep in mind that all of this was newly remodeled and newly restored. The homeowner had put a lot of work and money into achieving a certain look within the home, so we had to be extra careful to match up with that vision. We took the time to carefully study the selected texture that came with the remodel. We’re building for the home, not installing the piece and leaving it up to the homeowner to make it work. This is what we came up with: these Mountain Laurel Handrails were selected by the Walker Design Studio, and the color and texture were a perfect match for the interior stairs and balconies—it is almost like they were made for this home! 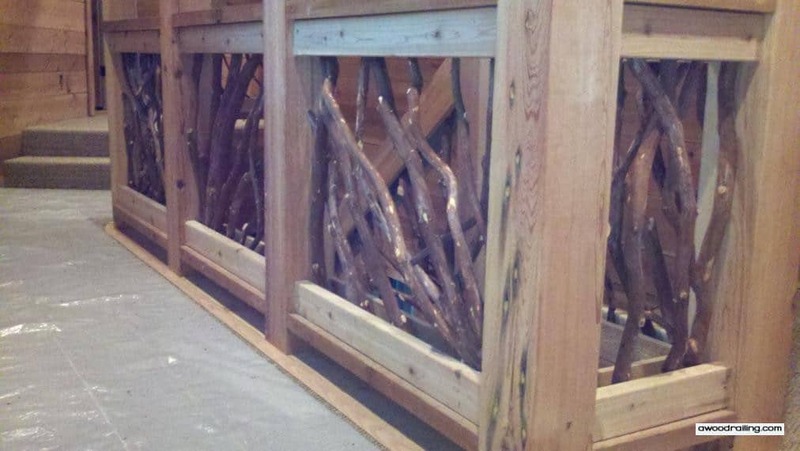 Mountain Laurel Handrails are unique woven branch railings, custom crafted works of art for interior stairs and balconies, and that level of customization makes for a truly beautiful work of art, something that looks like it was plucked right out of a natural landscape. 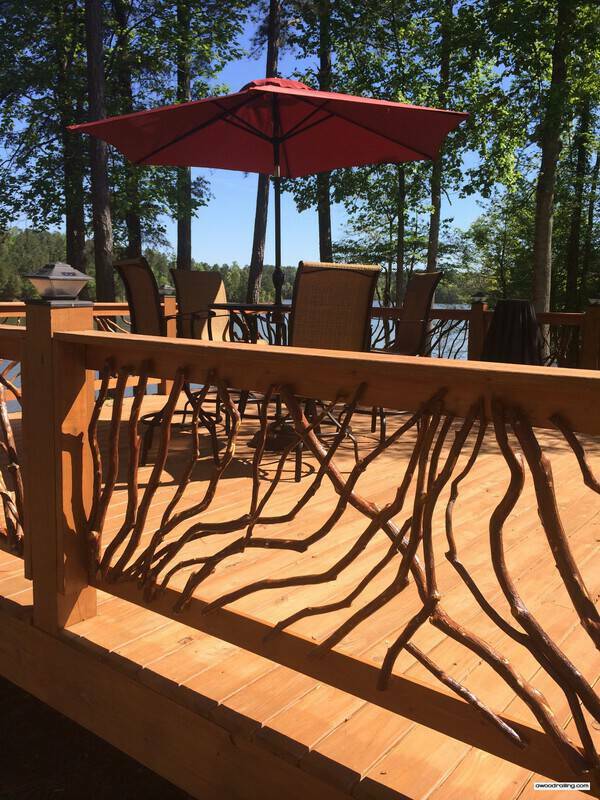 These kinds of railings are also great for exterior decks and porches, and since the outdoor of this home is a part of its charm, we wanted to give a sense of that within the home as well, almost like bringing that lakeside view into the home. The lighter colored stain matched excellently with the wood paneling and the interior walls, making it look like all of the home was crafted by one designer. While we take the entire room in when we are coming up with designs, we also look to identify something key and central to design around. This adds to a sense of unity and structure, and makes the room for more comfortable and less chaotic. We noticed one particularly charming feature of this home, that we identified as a kind of center of gravity: beautiful antler chandeliers. The curved lines of the piece gave the newly remodeled home a bit more of a rustic look, striking a balance between modern and classic. 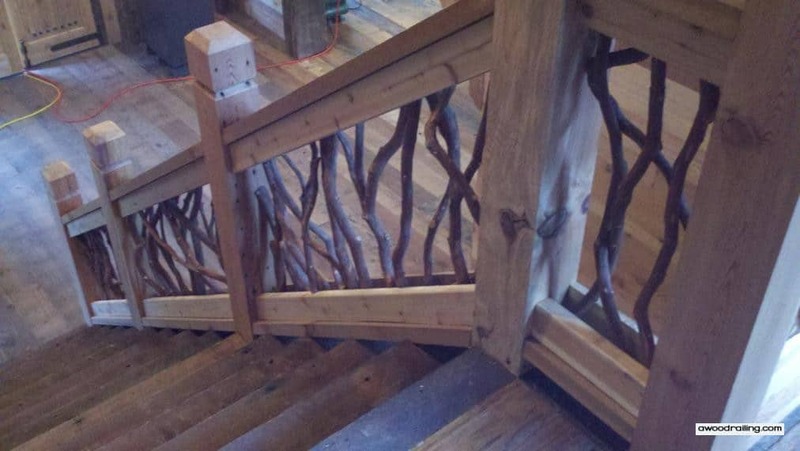 Wanting to match that sense of balance, we added some curved branches to the stair railing design. 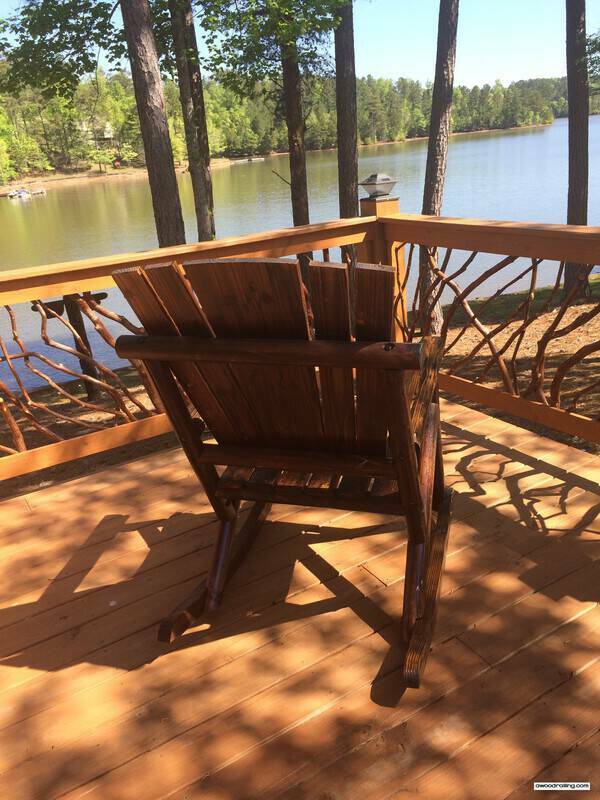 The stain on the branches is darker, striking a bit of a contract that brings out the elegance of the curves a little more, and makes the lighter colored frame of the railing look even brighter. What we particularly like about a design like this is that keeps the room looking spacious and open; because the design is see through, and does not block the view of the rest of the room, it prevents the interior stair railing from breaking up the room, and keeping it grand and open. And the contrasting colors pair very well with the multi colored wood paneling, bringing out the different stains and texture found on the floor. 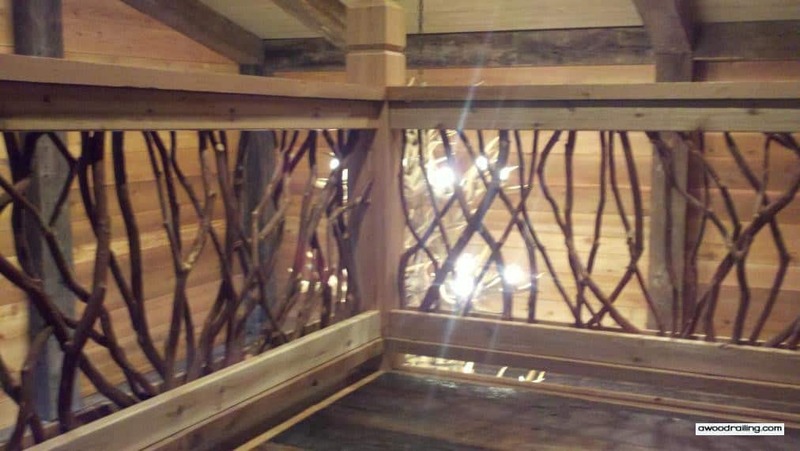 The branches also serve a functional purpose, and add more structure to the piece, and less open spaces that could be dangerous for someone climbing up the stairs. The wood timbers and shiplap paneling impose strong linear elements which is matched counterpoint by the organic and curved shapes of the Mountain Laurel Handrail. 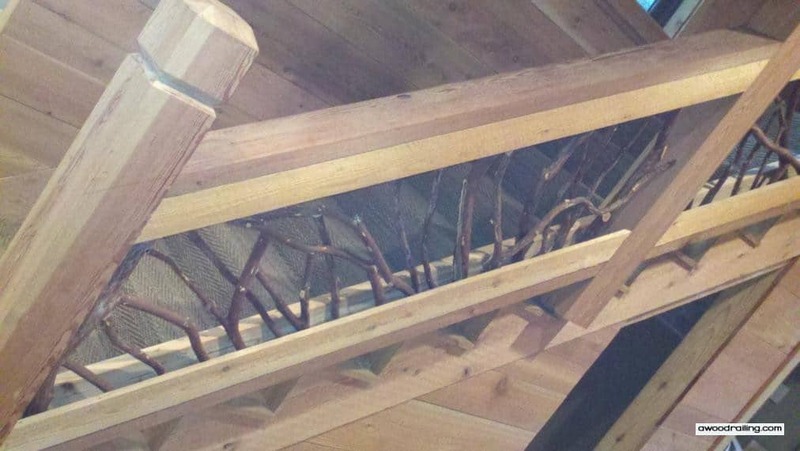 Since each section incorporates many different sticks and branches, each piece takes on a unique look which is sure to be an admired part of this grand entry stair. The stair railing looks both crafted and natural, which is a great metaphor for this charming lakeside home. We also noticed some other elements of the home adding to its overall style: knotty alder doors and the reclaimed wood floors, which combine to make the entryway to this home truly grand. These interior stair railings are one of the first things you see when entering the home, so it is especially important that the view upon entrance isn’t jarring, and matches well with the rest of the home. It does put a but of pressure on us to design something just right, but we certainly work well under pressure! When considering the size and structure of the stair railings, we used size to our advantage. 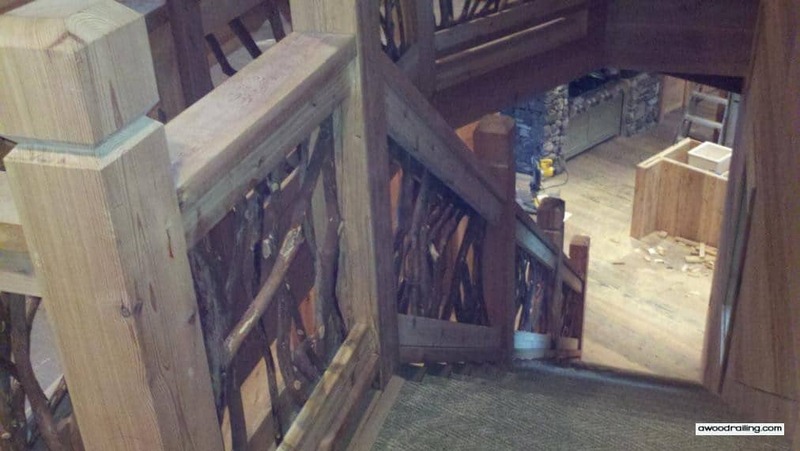 The height of the railing is large without being overpowering or silly looking. 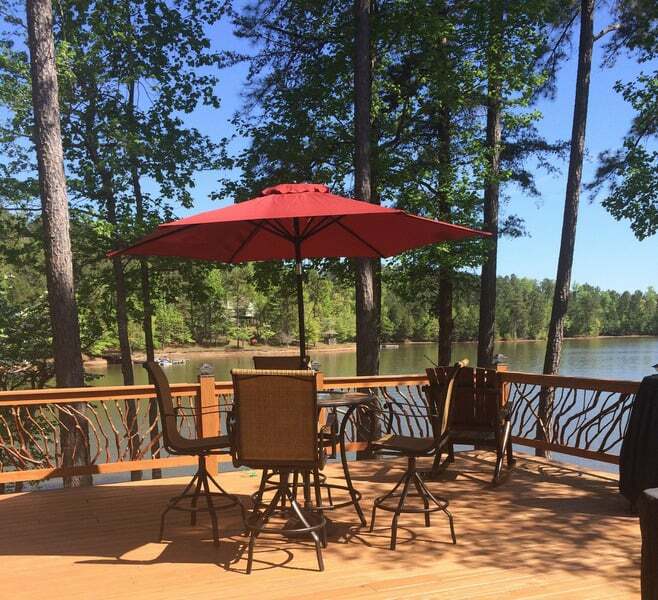 The vertical posts extend beyond the railing’s structure to add even more size and grandeur. The homeowner was looking to make the home look big and inviting, and we gladly went along with that very vision! A project like this takes a symbiotic relationship. Some designers and crafters may enter a home and stubbornly install the kind of indoor stair railing that they want, something to flex their design muscles, and would look good on its own in a portfolio. That’s not our intention. 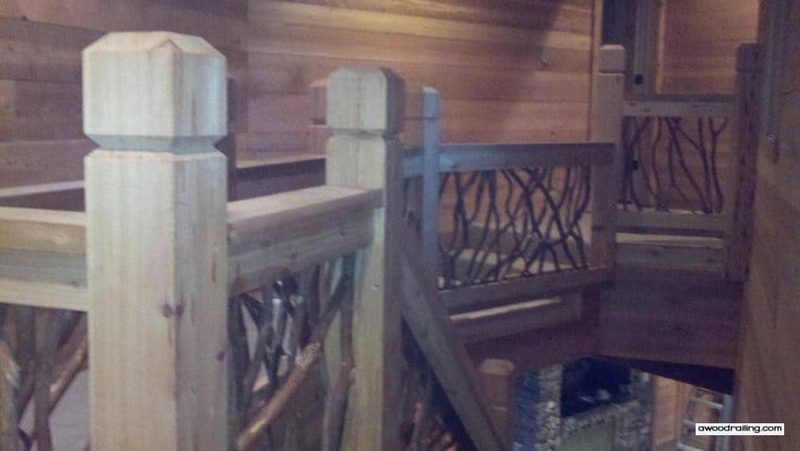 Instead, our most important consideration is the very final result, and the look of the railing within the entire home, not just a cropped photo for our website. It takes constant communication to pull off a truly customized project like this one, with the homeowners, the contractors, even the people who will be living in the home. The most important question we ask when letting a homeowner know what we are thinking of designing is “can you imagine yourself living in this home with this particular stair railing?” After all, we leave once the project is done–the person whose insight matters most is the homeowners. We’re also in constant communication with other fellow builders and contractors that may be involved in the process. You may be remodeling the whole house while you have us working, we may need other contractors to help us with installation of the project. We like to think we play well with others! We’re always willing to seek help to make sure everything we install is safe and secure, because an interior stair railing that doesn’t keep you safe while going up the stairs may as well not be there at all. From our materials, to our installation process, we are double checking every step of the way. 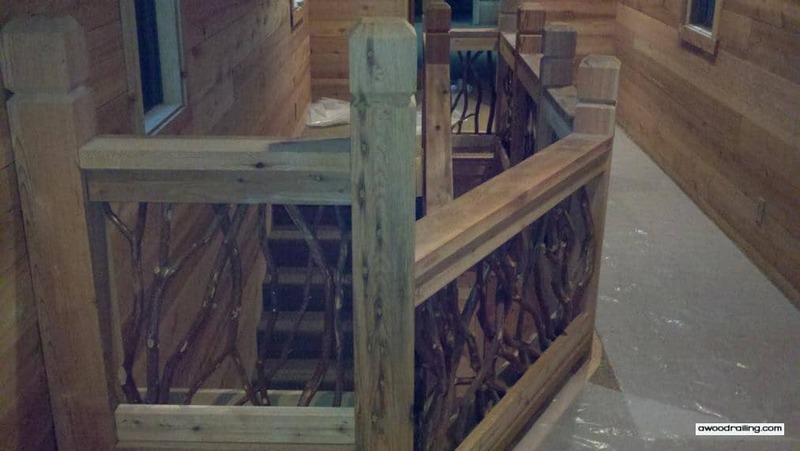 If you’re considering getting custom indoor handrails made, Mountain Laurel Handrail sections are a great choice. They are custom built to your measurements. Sections are shipped nationwide and delivered to your location ready-to-install. This easy railing system install means that on-site labor costs are reduced and overall build cycle times are decreased. While we don’t build just for the sake of an online portfolio, you can still see how our work meshed well with the rest of the home in these photos. 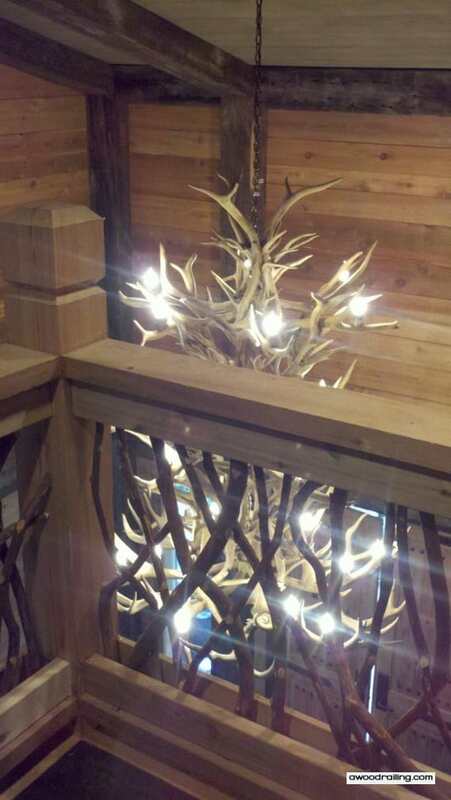 Above is a cool view of the antler chandelier mentioned before, looking through the railings. You can see the way light travels through the branches and sorts of bounces off the different corners of the room. We love the mystique it adds to the environment without necessarily taking away much light. The room still feels big and inviting. This photo shows you the height and size of the railings. They don’t take too much space away from this hallway area, while still adding to the majestic atmosphere of the home. And notice the coloring–the contrast of the branches and the large posts look almost perfectly paired with those multicolored wall beams. 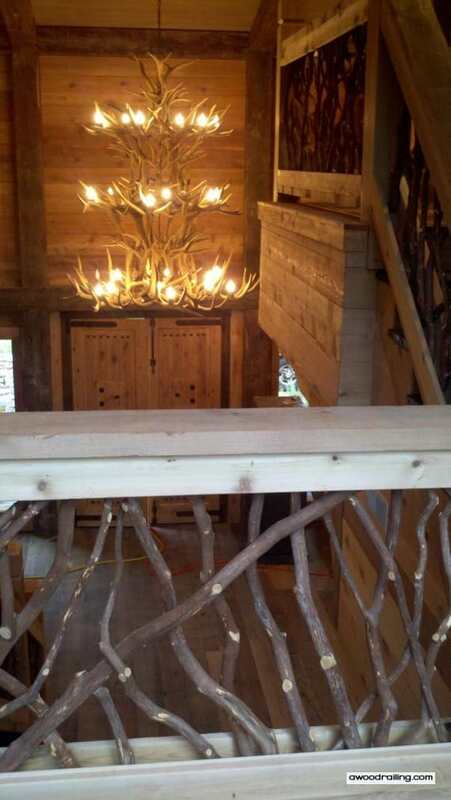 You can see above why we love using these branches in our interior stair railings. They add structure to the railings, are essential for safety by taking away major gaps someone can fall through, but they don’t block the view of the room. You can still look up or down and get a good view of the environment through the beams.